Today I'd like to revisit another old post, this time a knitting project that I wrote about way back in December of 2008 very shortly after that huge ice storm that shut New England down for weeks and did so much damage to the area. The project I'm talking about is my version of the self-tying neck scarf. You can read about it by clicking HERE and see that Martha Stewart and I seem to have figured out the same pattern! If you read the old post about this, you will remember that this scarf was on loan to me from a local yarn shop that was going out of business some very many years earlier. I had snapped this photo of the sample scarf with my tape measure next to it for reference, and jotted down some notes on how I thought this scarf could be knitted. As it turned out, my notes were pretty accurate, and I went on to make many of these fun little accessories over the years using different weight yarns and making the appropriate adjustments for stitch count and rows and such. The written pattern for this scarf, using baby yarn, can be found in that old post from 2008 which you can find HERE. A while ago, I got a message from one of my Facebook friends asking for help on the section of this pattern where the stitches get divided to make the little loop that makes this such a unique design. 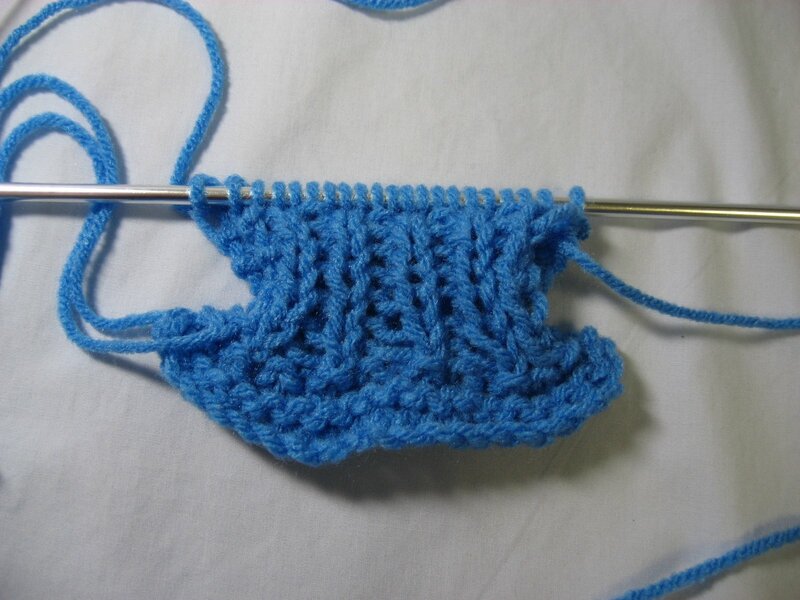 So the following video shows that section of the pattern in the works using just a sample of knitting. If you are interested in following along, you might want to bring up the old post in a separate window so you can view the pattern at the same time you are watching the video. Or you could also just print it out and follow along. This is what the sample looks like at the end of the video, obviously not the whole scarf or even the entire beginning section, but just enough to show how to divide the stitches and then bring them back together again. Here's the video, for my Facebook friend Santina, and anyone else who is interested in making this fun self-tying knitted neck scarf. If you make one, I'd sure love to see a picture of it and know whether this video was helpful to you. THANK YOU for this video ...I was SO confused as I've not been knitting for very long. It was hard to make any sense of the written instructions for the loop, but seeing the real thing is WONDERFUL! Thanks for the helpful video! I wish I would have found it earlier--would have saved me from ripping mine out several times! LOL! School Charity Banner ~ On Display! VOTE ! ...again? and a fun swap!